Pure black onyx with it's smooth waxy luster makes a stunning backdrop for shining metals and combines well with flashes of color. Onyx is a fine textured form of quartz in the Chalcedony family. Pure black is the most famous variety but onyx is also found with banded colors. It is formed in the gas cavities of lava in a multi layering process similar to that of agates. When the stone has a black base and a white upper layer it can be used to carve cameos. The finest quality onyx is found in Brazil, India and Madagascar. 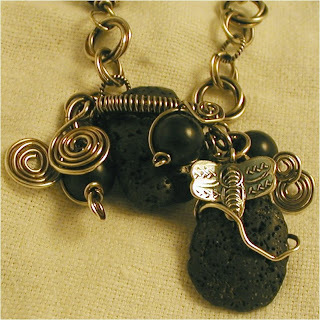 Onyx stabilizes, heals and strengthens the root chakra so you may become more productive in the physical world. Black onyx is thought by some to have protective qualities, especially for travelers. It is said to be useful in fighting basic fears and in helping to create the opportunity to move beyond bad relationships. It can also help to heal old emotional wounds. Onyx was known to the Greeks and Romans. The Romans associated onyx with courage and thought it to be useful in defending oneself from unfair criticism. It was used in Egypt as early as the Second Dynasty to make bowls and other pottery items. Onyx is one of my favorite stones to work with. As in other forms of design a little black belongs in everything. It pairs well with pearls, with silver and with splashes of strong color. Here are some of our pieces that employ onyx. To clean your onyx jewelry use a soft cloth or a mild detergent. Avoid chemical and ultrasonic cleaners as these my bleach the color.